While working on the Bloom Where You Are Planted quilt as a surprise for my friend, Laura, we had scheduled a ski weekend together! Out of the four of us, two like to ski and two don't. The two of us that didn't want to ski decided to stay at the cabin and work on projects. 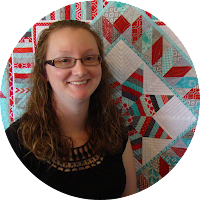 It was my very first sewing retreat! Of course I couldn't work on the Bloom quilt, so I needed a different project. I had recently seen a tutorial for what seemed like a quick and easy quilt, so I decided to try it! I bought the fabrics at my local Jo-Ann's (in Las Vegas, NV). 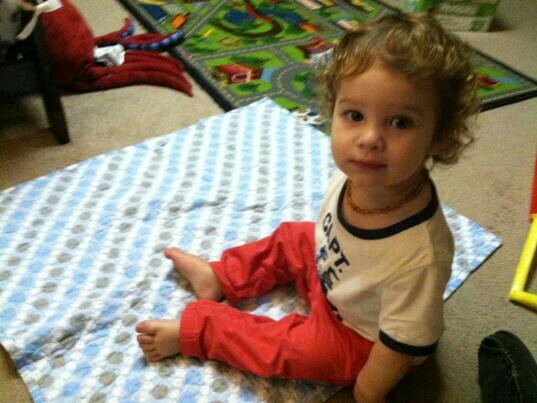 I cut the fabric on the kitchen counter and ironed on a towel on the floor. I got three quilt tops (two blue and green ones along with a red and black one) done over the weekend! (March 3rd and 4th) I loved having such quick finishes amidst the much longer process of the Bloom quilt. During spring break, Laura and I decided to have another project day at her house (April 5th or 6th). 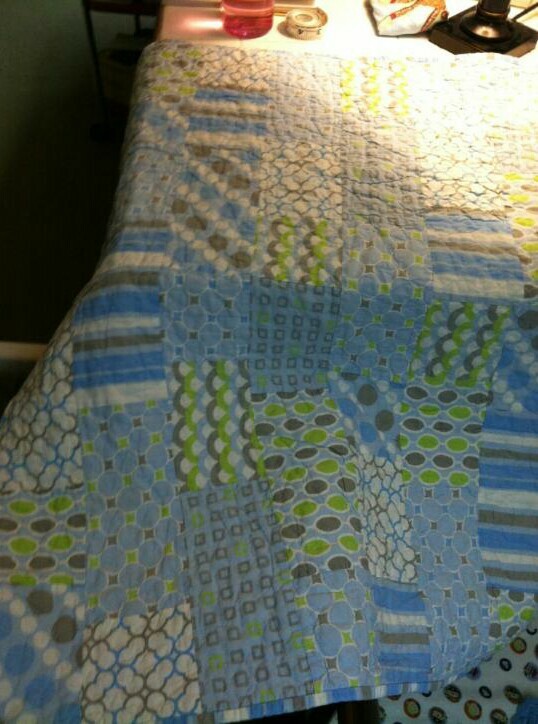 I used this time to quilt the two blue and green tops. I wanted to use an all-over stipple design. Still unsure of how to free-motion quilt on my Bernina 930 Record, I experimented many methods - and learned many lessons! 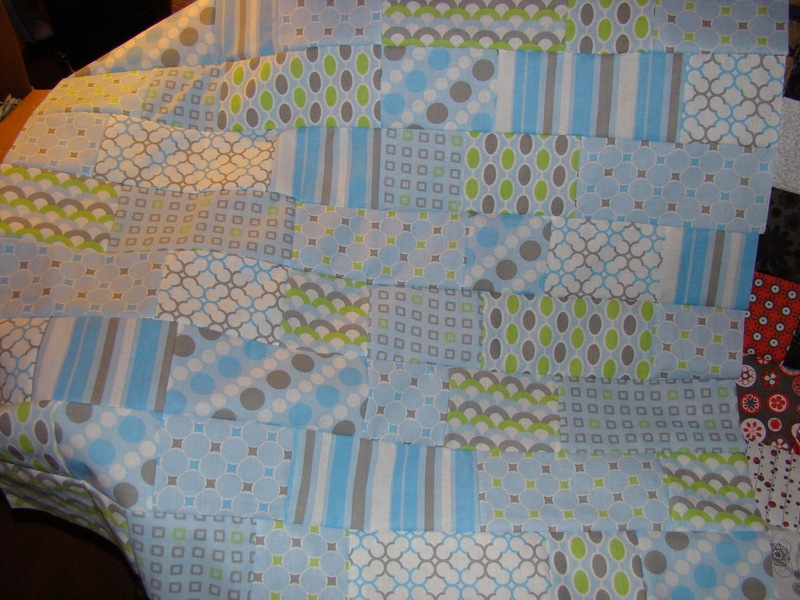 Lesson 1 - Start quilting in the middle of the quilt and quilt to the edges to help prevent puckers. Lesson 2 - Using a disappearing ink pen to draw the quilting design is a huge help when beginning a new design. Lesson 3 - You must have a foot on your sewing machine at all times. I decided the best method was still to use the knee lift to barely lift the presser foot off the fabric as I moved the quilt around. It still caused issues, but was the best I could do with what I had. 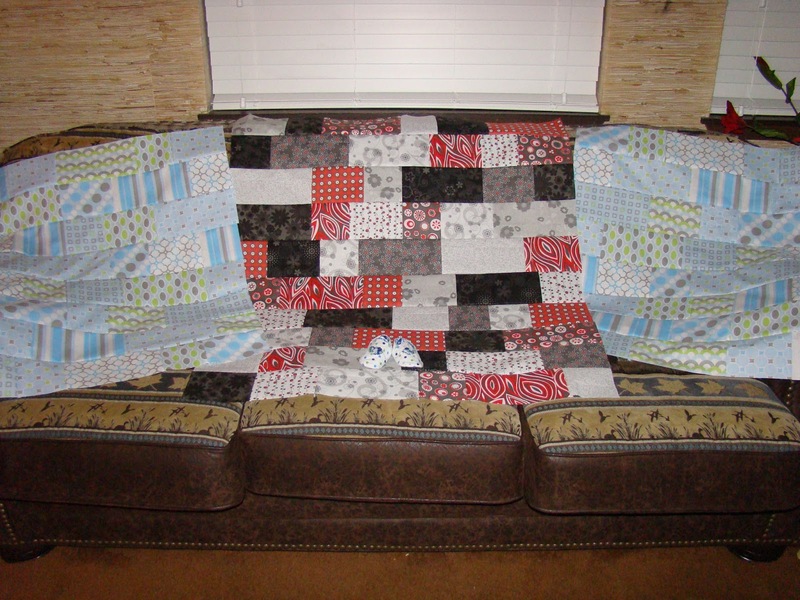 One of the quilts ended up having two large puckers - one in the front and one on the back due to the learning process. 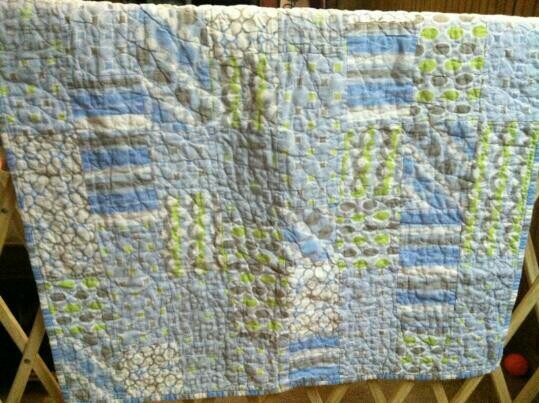 I gifted one quilt to my friend, Kiffany, at her baby shower on June 2, 2012. 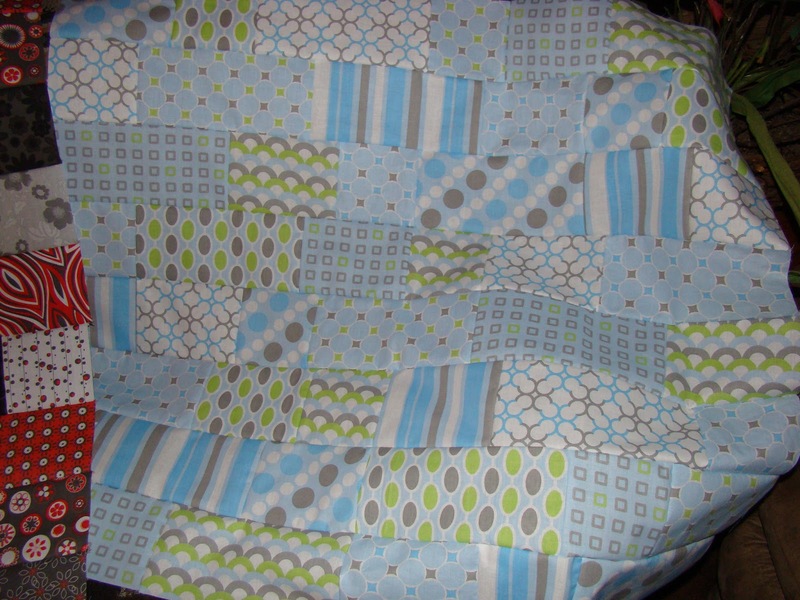 The second quilt was gifted to my friend, Laura, when her son was born in February 2013, bringing the story full circle. 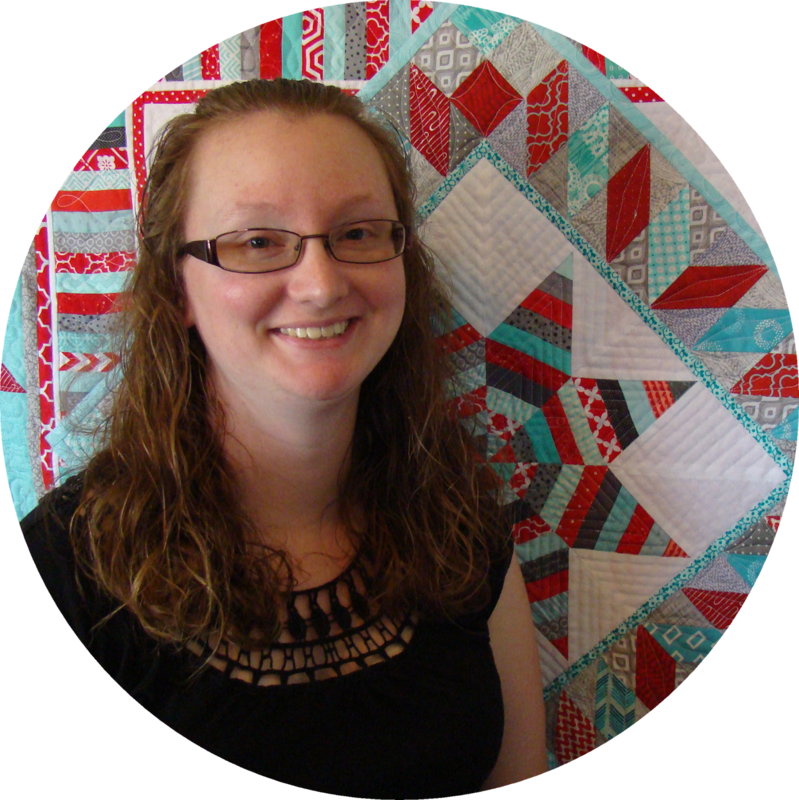 You can read the rest of the story about the red and black quilt here. These are some good looking quilts. And the size makes them perfect for sofas and couches. You can sit snugly in the iving room with family and a night cap!